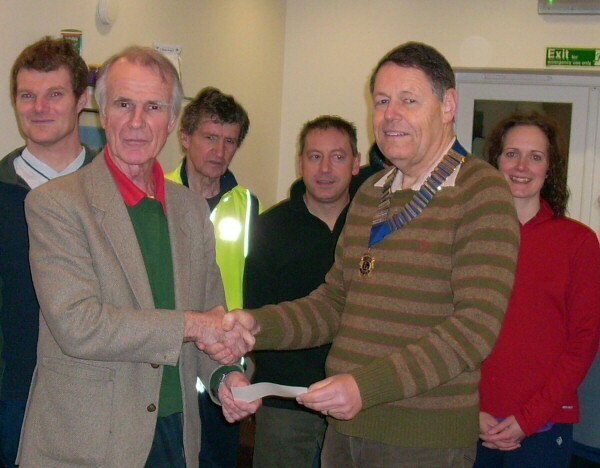 Dr Hugh Bethel, Chairman of Alton Runners presented a cheque, for £2000 to Alton Lions President Graham Dix at the Alton Runners annual general meeting. Each year Alton Runners, together with Alton Lions, organise the Alton 10, a ten-mile road race in May and, at the start of the cross-country season in October the Downland Challenge 10k & 5k races. Runners pay a fee to enter the races and after expenses have been deducted the surplus is donated to Alton Lions to support local charities and needs. Alton Lions provide the race administration, course supervisors and marshals for each race. “It is always a pleasure to team with the two main events for Alton Runners and our work for the community is helped as a result” said Graham Dix said on receiving this year’s cheque. The ten mile road race is part of the Hampshire Road Race League competition and draws a large entry from all over the county as well as many other runners from the south of England. With last year’s entry reaching over 600, Alton Lions are expecting as many again for this year’s race, which is planned to start from Eggar’s School at 10.30am on Sunday 8th May. The Downland Challenge is being run on Sunday 9th October and will start and finish at Anstey Park. The 10k cross-country race is combined with a 5k route for younger members. Local schools usually help promote this event in order to encourage youngsters to keep fit and there is a cup for the school with the most successful entry. More details can be obtained form both the Alton Runners website www.altonrunners.co.uk and the Alton Lions website www.altonlions.co.uk and entry forms can be obtained from the Race Secretary at dave.crocker@btinternet.com / 01420 85358.